Have you been working hard on your dissertation or research project this semester? Do you have an interest in presenting to fellow students and faculty? Do you need something to add to your resume? You're in luck! 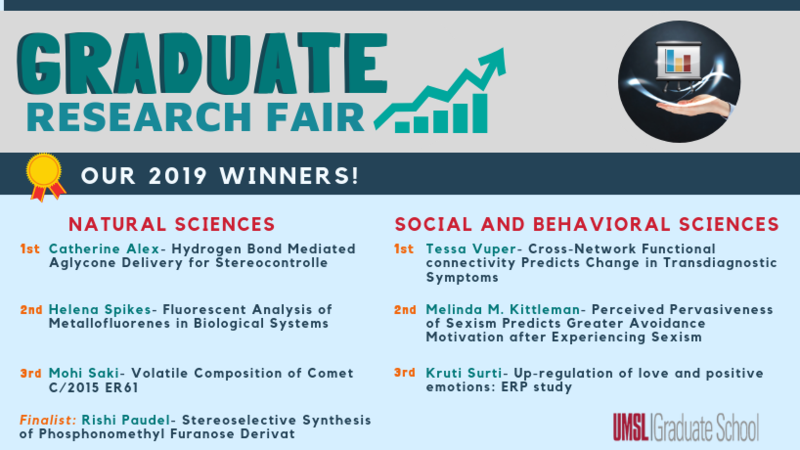 Register for our Spring 2019 Graduate Research Fair today! The Graduate School sponsors a Graduate Research Fair annually in the Spring semester. This event allows graduate students from all degree programs to display the research that they have been working on throughout their time as an UMSL student. We want our students to have a change to show off all their hard work and get feed back from their fellow peers and various faculty members. Before signing up, logout of GMAIL. You MUST login using yourSSO@umsl.edu. *Students that are wanting to attend without presenting are not required to sign up. If you have any questions or concerns, please contact The Graduate School at gradevents@umsl.edu or 314-516-5900. I am an undergraduate student can I participate? Check out the Student Research Office for more research opportunities! How will the posters be judged? All posters will be separated into 2 different categories (A) math/computers/natural sciences (B) social sciences/humanities/business/education. The first round of judges will begin at 3PM. Each student will get 5 minutes to present their research to the judges. Posters that are selected will move onto the second round and be judged a second time between 4PM and 5PM. Hint: Target your poster to a general audience, because you may have viewers and/or judges that are not from your specific area of study. Will the graduate school provide an easel? No. All students must bring any materials necessary to present their research (poster, easel, backboards, pushpins, computers, etc.). The Graduate School will provide a 2' x 5' table for your poster. In most cases, the best option it to use an easel with your poster mounted on a 3' x 5' poster board. Each poster that makes it to the second round will receive a $100 prize to their student account. In addition, students that are awarded 1st, 2nd, and 3rd will receive $500, $300, and $200 during the second round of judging in each broad category. Masters students have the ability to win these prizes and will also be judged separately. I do not want to present, but I would like to see other students' research. Do I need to stay the whole time? No! We encourage students to come and go as you please! All posters must be set up by 3pm.